Infield Media & Promotion, Inc. Announces the launch of a new business "Infield Media & Promotion, Inc." by a well-known Washington, DC executive. 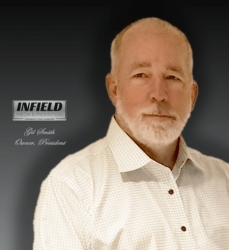 Concord, NC, February 14, 2018 --(PR.com)-- Gil Smith, a former government executive and corporate advisor, has launched his newest effort, Infield Media & Promotion, Inc. (Infield). Found in Fall of 2016, Infield is now Headquartered at Charlotte Motor Speedway in Concord, NC. This business is Smith’s entrepreneurial effort entering the Public Relations and Marketing space focused on Athletes and Artists. He will also maintain his Corporate Advisory services offering through Infield. This work continues Gil in his executive role by applying his 30 years of executive business management experience to businesses and operations needing his advice and guidance. Infield was born of Gil’s love for photography, media, motorsports, music, and sports in general. He and his colleagues have built a business model that is based on the new “gig economy” where companies own few assets, and capitalize on providers for services that they trust and have vetted to deliver quality services at a high-value return. Through this network of providers Infield will deliver quality and highly effective Public Relations and Marketing packages. The company has already built a portfolio of clients that include a winning NASCAR driver, IndyCar Drivers, top quality musicians and performers, a world class illustrator, several businesses serving government, and Veterans Services Organizations. Infield is built on four pillars: Sponsorship Acquisition and Management; Music Publishing and Production; Imaging; and Business Advisory Services. These four pillars cross over to each other so that each specialty area can capitalize on the other. Sponsorship Programs: Infield is poised to seek and develop sponsorship programs for businesses, athletes, musicians, and artists. With its vast network of contacts developed through lengthy successful careers Infield Media & Promotion, Inc. is able to develop relationships that create value. Whether Infield is seeking sponsorship for an athlete, an event, or helping a business place and execute a sponsorship program Infield has the expertise and experience to assure that all parties maximize their value and get return on investment or effort. Music Publishing and Production: Infield is a BMI registered music publishing company (Infield Music Publishing) and has the resources and talent to produce everything from full 10 track albums to 7 second jingles. There is a portfolio of providers supporting this area; to include songwriters, producers, musicians, production companies, and booking agencies. Imaging: Gil is a lifetime photographer and has captured images of many famous people in entertainment and sports. Infield has studio affiliations in Nashville, Charlotte, and Washington, DC and can produce imaging that ranges from commercial to fashion and boudoir to high impact journalistic documentation or business profiles. Through provider affiliations Infield can produce some of the best motion picture and video products in the industry. Business Advisory Services: The foundation of Infield is the business acumen of Gil and his long history of driving organizations to peak performance. His business acumen is the foundation upon which the other pillars rise. Gil serves on several boards and currently advises Washington DC area business and foundations on matters ranging from business development, to financial structure, marketing, and organizational structure and process. Click here to view the list of recent Press Releases from Infield Media & Promotion, Inc.